Pictured below is another of our low voltage disconnect (LVD) circuits designed to protect batteries from being overly discharged. This particular LVD has a few added features. First of all, to reduce power consumption by the LVD itself, it has been designed to work with a latching relay. The chosen relay (click here to download the latching relay datasheet) has two coils – one coil to latch the relay closed (set coil), and the other to release the relay (reset coil). This controller can be programmed as per our standard REUK Programmble Low Voltage Disconnect with the disconnect voltage and cancellation voltage. While the voltage is good, the relay will be left latched closed, and then when the voltage falls below the disconnect voltage, it will be latched open. 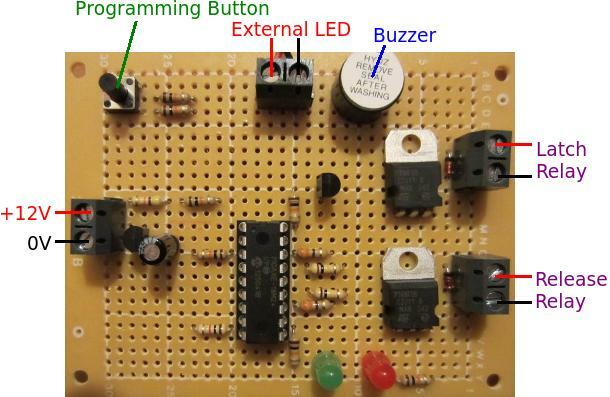 As an added feature, when the measured battery voltage is 0.2V or less more than the disconnect voltage, the external LED (which can be panel mounted somewhere easily visible) turns on, and an on board piezo buzzer sounds briefly every half a minute until either the user starts to charge the battery, or the disconnect engages due to even lower measured voltage. If you need any kind of low voltage disconnect circuit, email neil@reuk.co.uk with details of your exact requirements.